I’ve waited for this my whole life! That’s what Caiden said to me this morning when I brought out a box of cereal and put it in front of him for breakfast. When I was getting a few needed items at the store last night, I saw this and it was a little over $2. I had to buy it because I figured the boys would have a blast watching their milk turn green. They haven’t had cereal in my house in …. months, maybe? 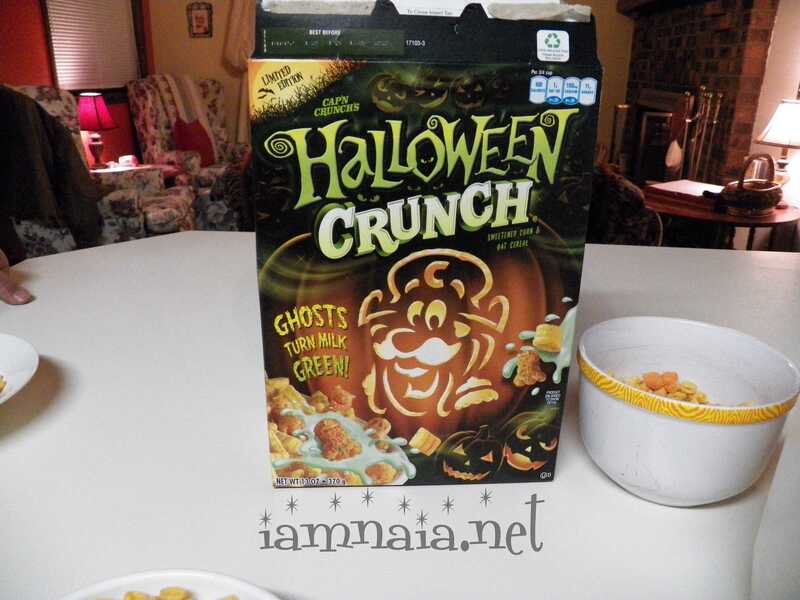 They enjoyed it – especially the part about their milk turning green. 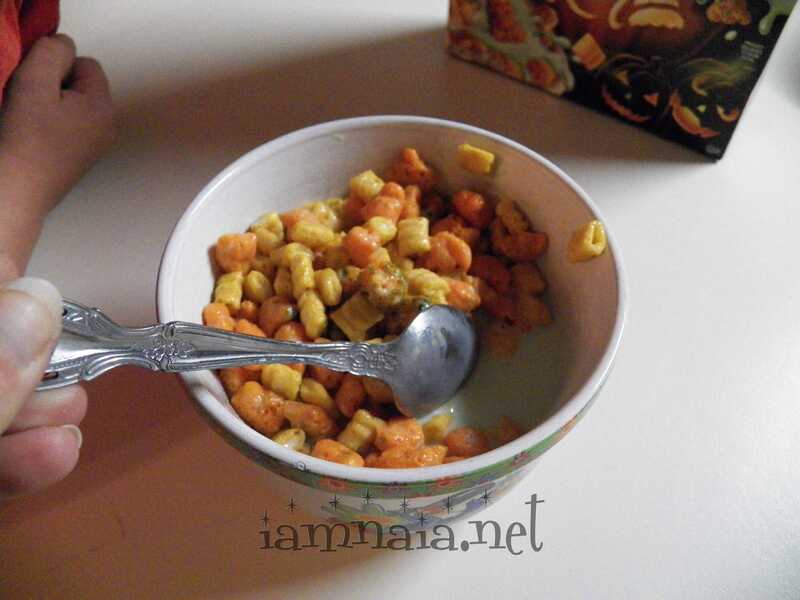 Occasionally, a bowl of cereal for breakfast isn’t so bad. Having it every day is not going to happen – no matter how much my children might beg because of their indulgence this morning. A long time ago, I decided we were not going to have such frivolities in our house for breakfast. 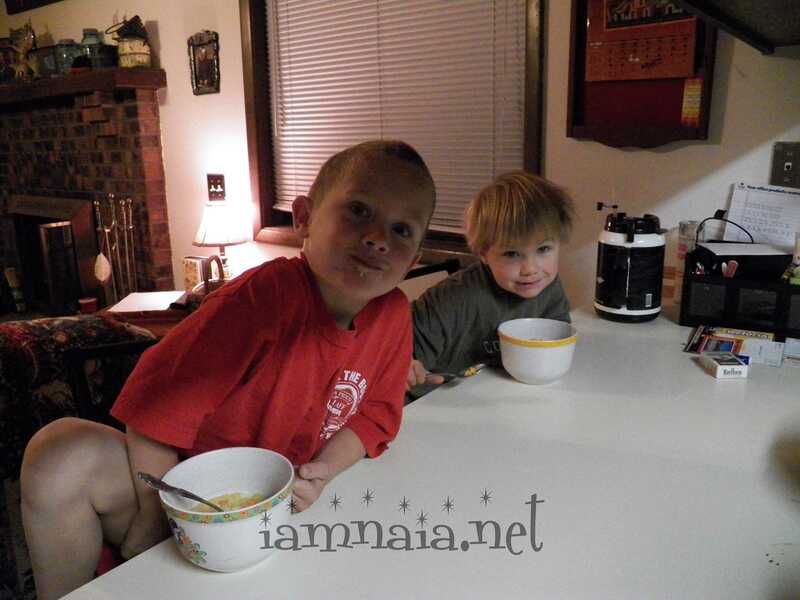 First, I wanted (even back then) my boys to grow with more than just cereal for breakfast and secondly, I didn’t want them to ever fight about what they will or will not get at the grocery store for breakfast. I think I’ve done pretty well as they don’t whine and cry very often about getting cereal when they go shopping with me. And so, this minor indulgence won’t hurt too much. 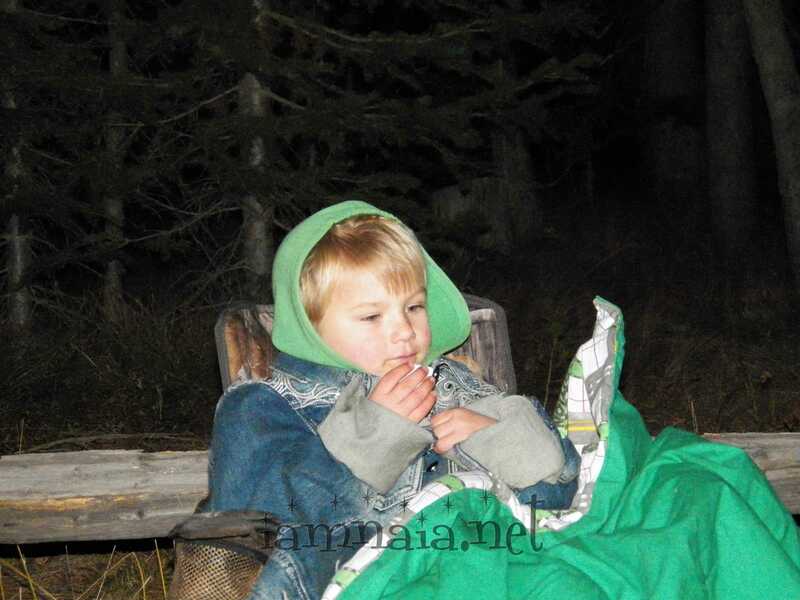 Beautiful Brendan keeping warm near a fire with his jacket, my jean jacket and the blanket I made for him a short time ago. 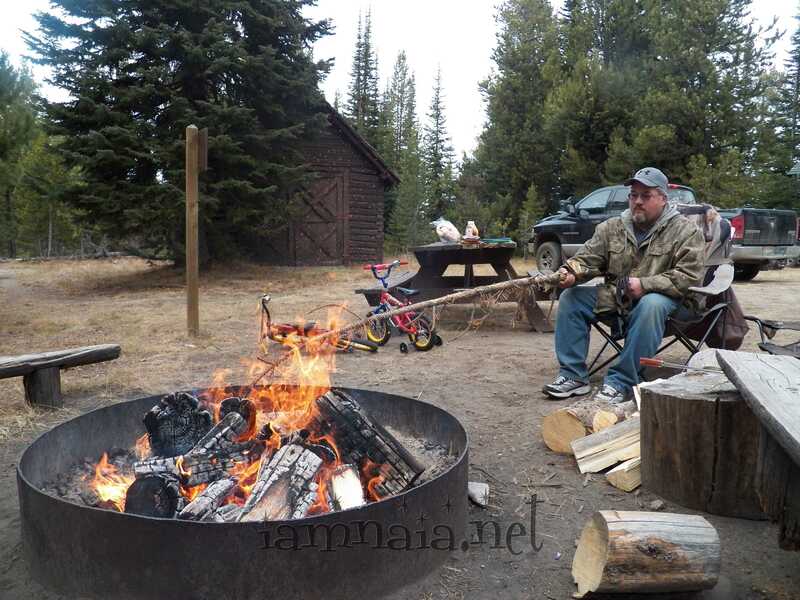 Of course, there is a marshmallow in his mouth – that’s what campfires are all about. Right? 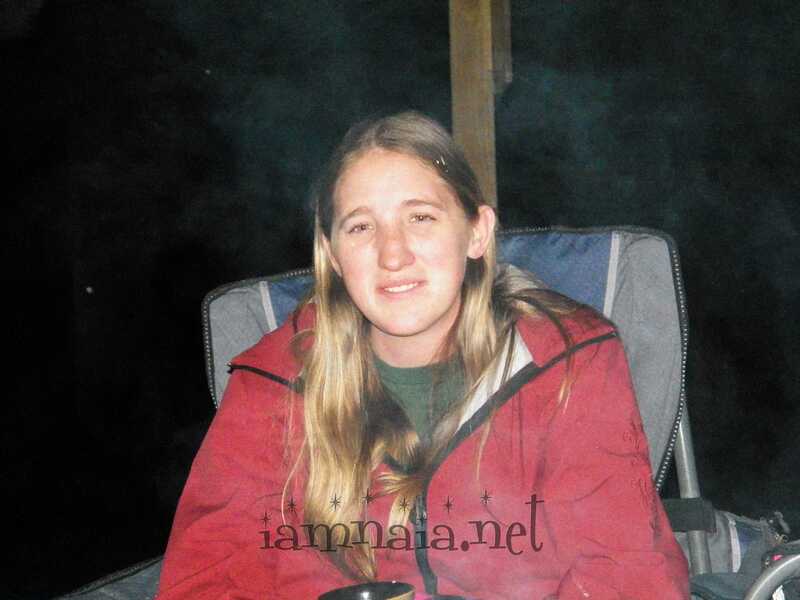 Jen all bundled up and enjoying a cup of coffee with the fire. 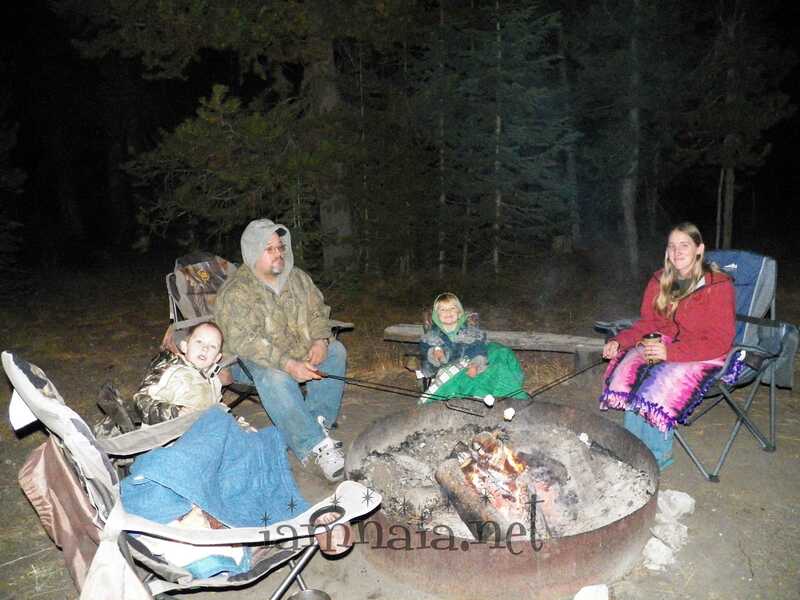 The first night – campfire and marshmallows. 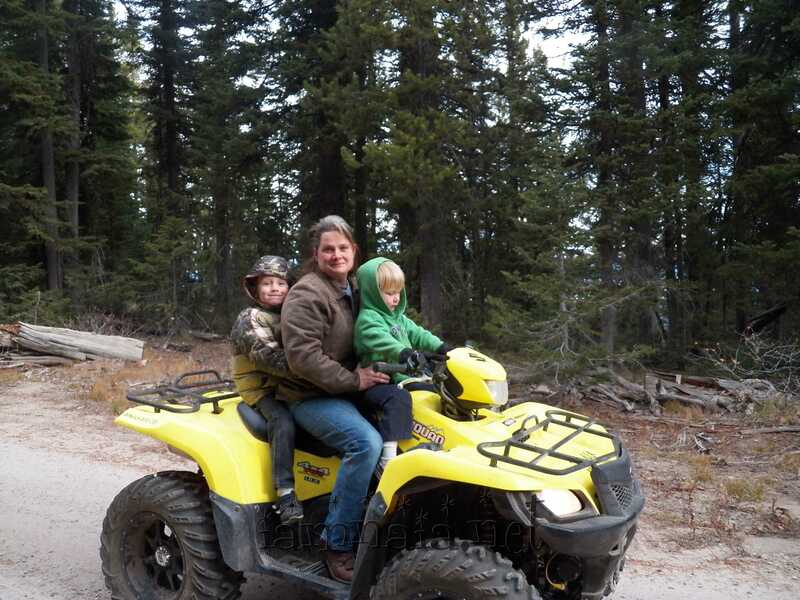 Riding the 4-wheeler while daddy cuts up dead trees for our firewood. Jen helping to load the truck with firewood. She is tireless – and she even helped chop the firewood for our fires this weekend. 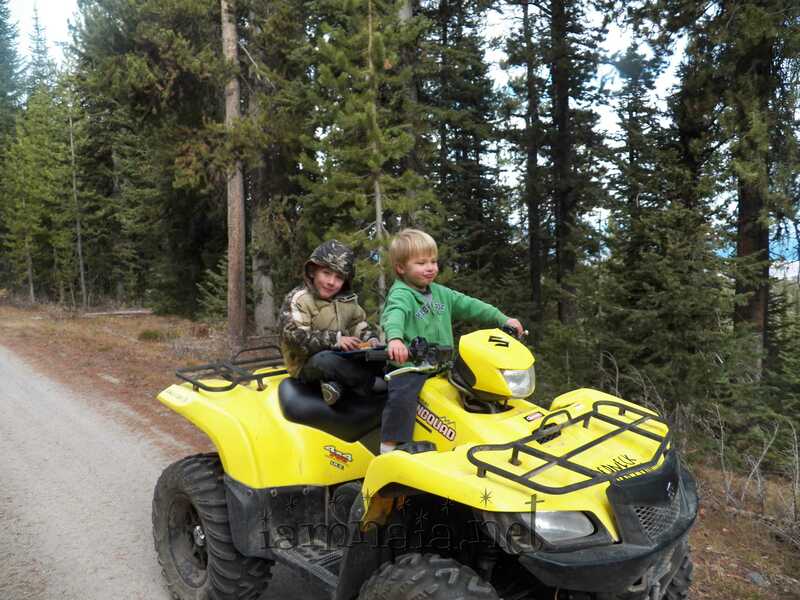 The boys played on the 4-wheeler every chance they could. 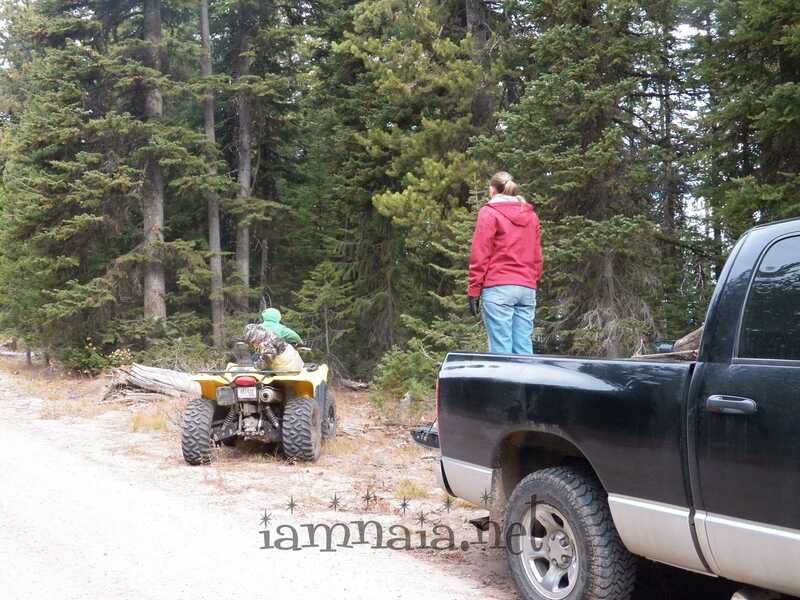 That’s pretty much all they did, when they were allowed outside and near the 4-wheeler. 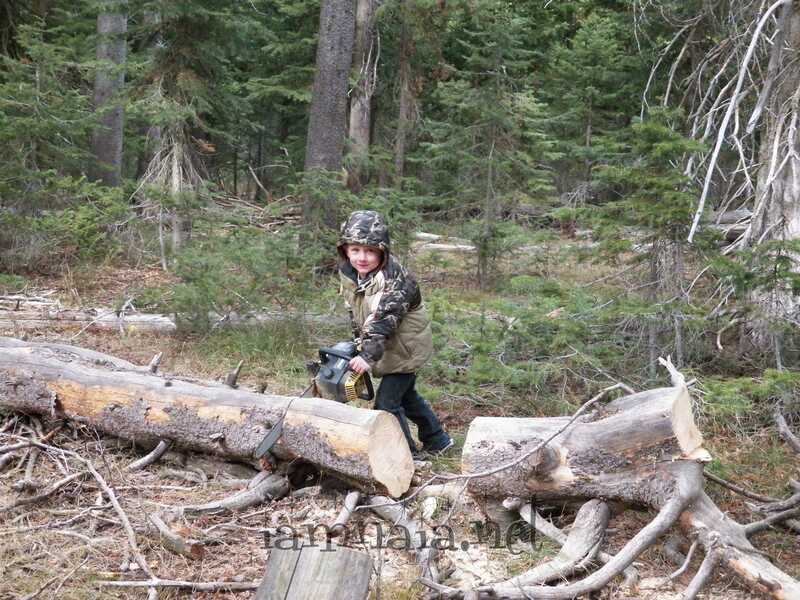 Caiden pretending to help daddy cut the wood. No, we didn’t let him turn it on. He really wanted to but, o’well for him. Right? It all goes back to that saying I taught them, “God told mommy she had to get you to age 18 without losing body parts.” They have it memorized and bring it out every time I don’t. 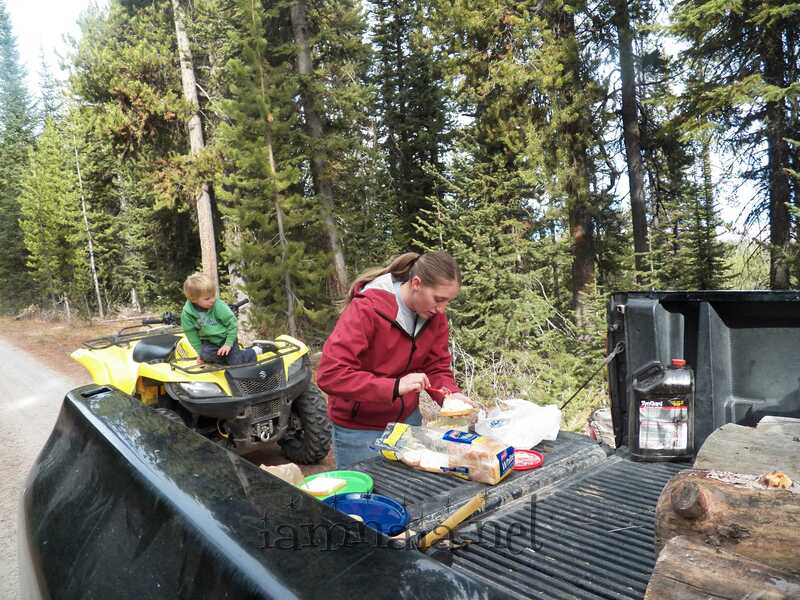 Egg salad sandwich lunch on the tailgate. 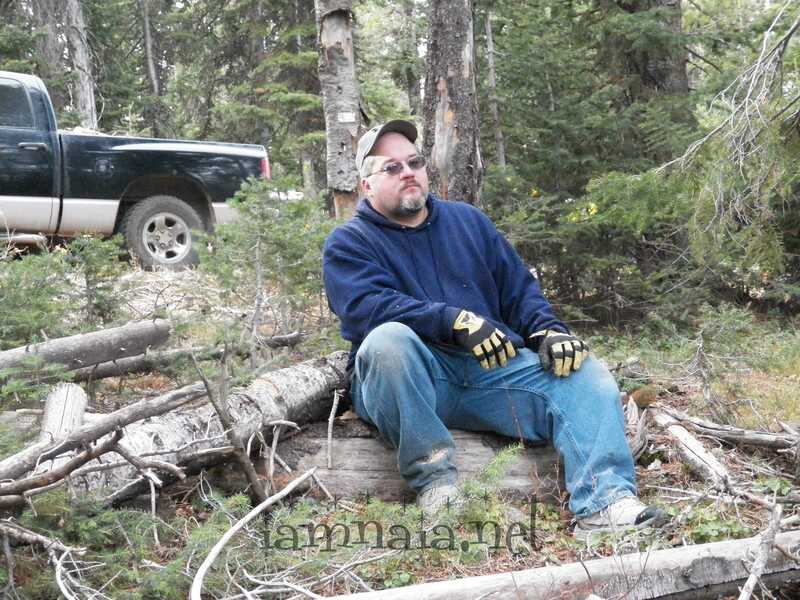 Daddy taking a break and eating his lunch. He says he looks like a stud. I laughed. Probably not the best response… right? Brendan driving while Caiden eats lunch. 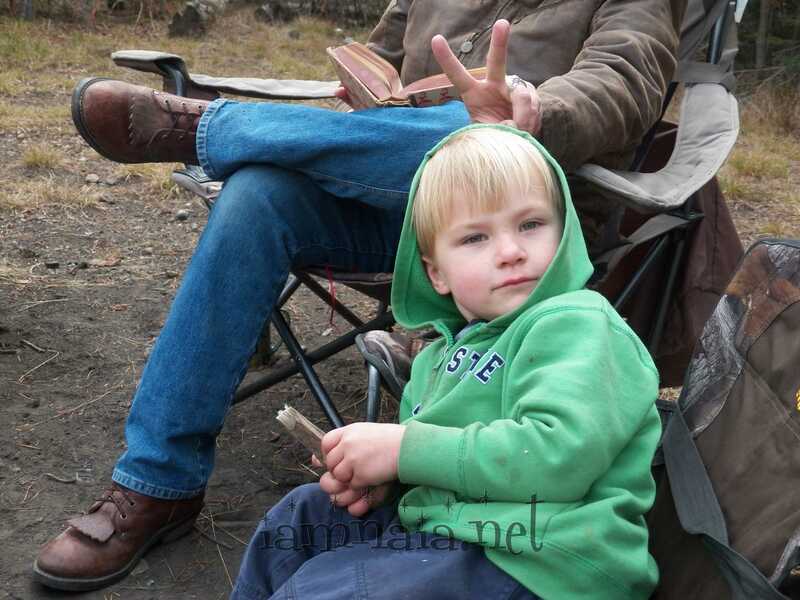 Check out Brendan’s mouth – he’s making the 4-wheeler noises. Bath time – trying to get cleaned up and not smell so bad (mostly because of peeing outside and such). Apparently my child doesn’t do well in closed-up spaces. 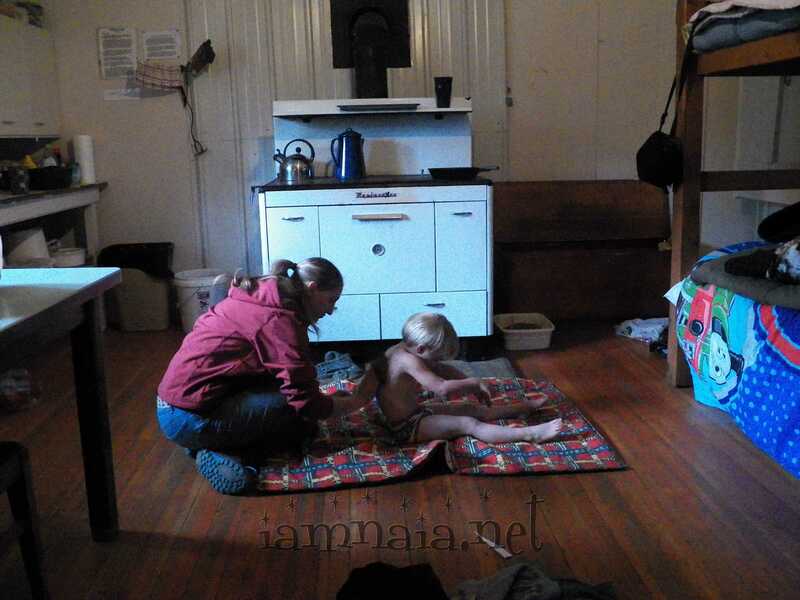 If it’s a small room and the door is closed, he’ll start bouncing off the walls. As soon as you open the door, he settles down. 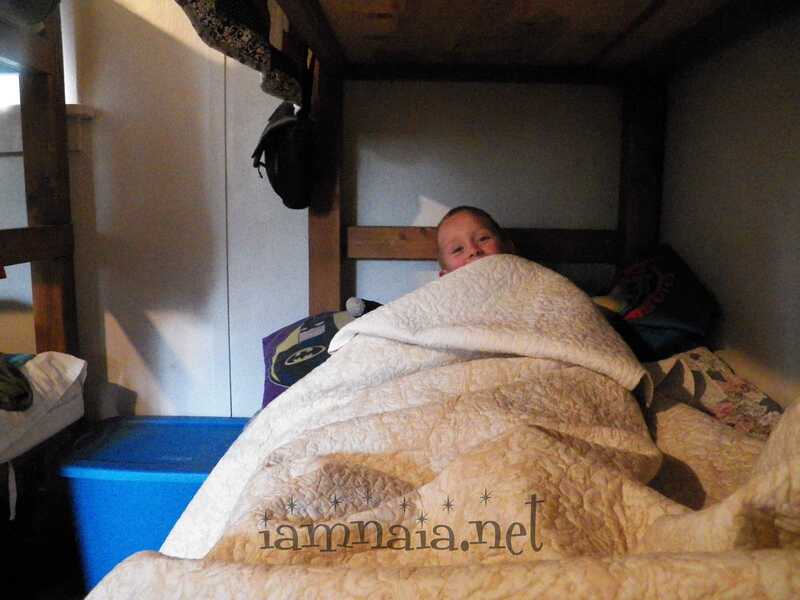 Well, this cabin we stayed in is smaller and we do keep the door closed to keep the heat in, so he was constantly bouncing off the walls. On Sunday morning, I finally got smart and, when we all got up and started breakfast, I sent Jen and Caiden for a walk while I cooked breakfast. It helped and he came back subdued (until the door was closed) and we didn’t get as -upset- with him as we normally would. 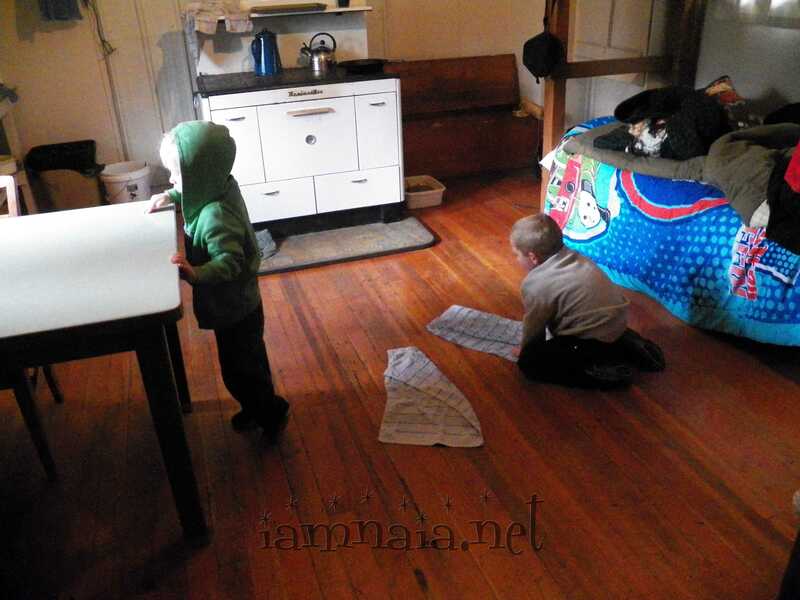 The boys helped me clean up the water all over the floor from a failed transfer of water from our big jug to our table-top jug. 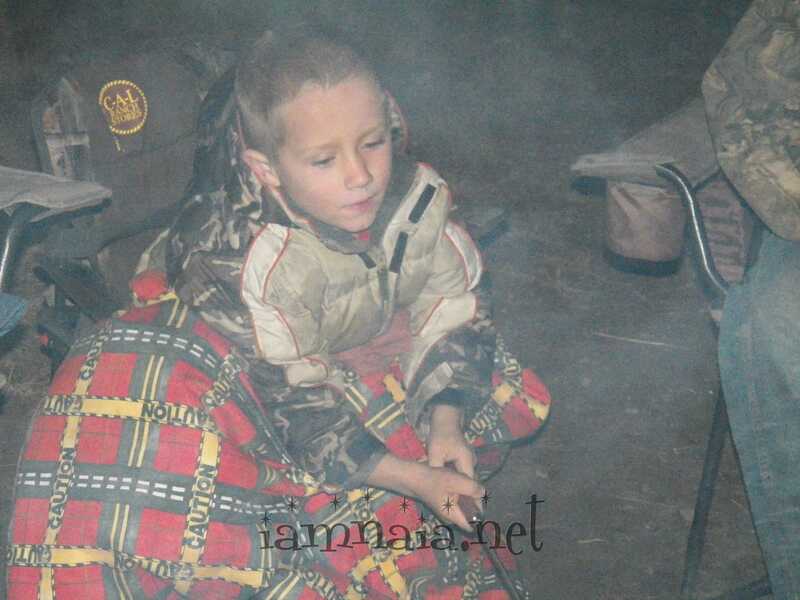 They ended up cleaning everything in the cabin and then going outside to clean things they found, as well. I let them – dirty towels doesn’t mean a thing against boys that have something productive to do. 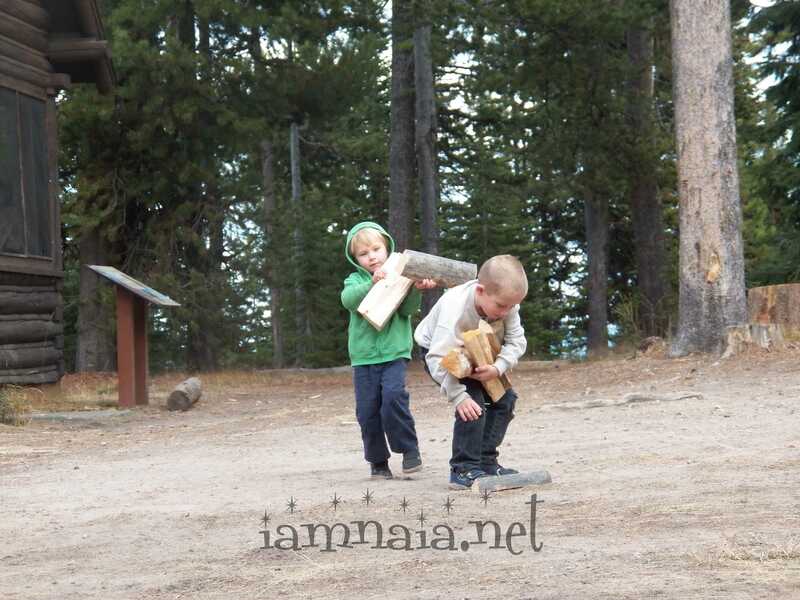 Carrying wood to the firepit outside so we can build a huge bonfire. Just having a bit of fun. 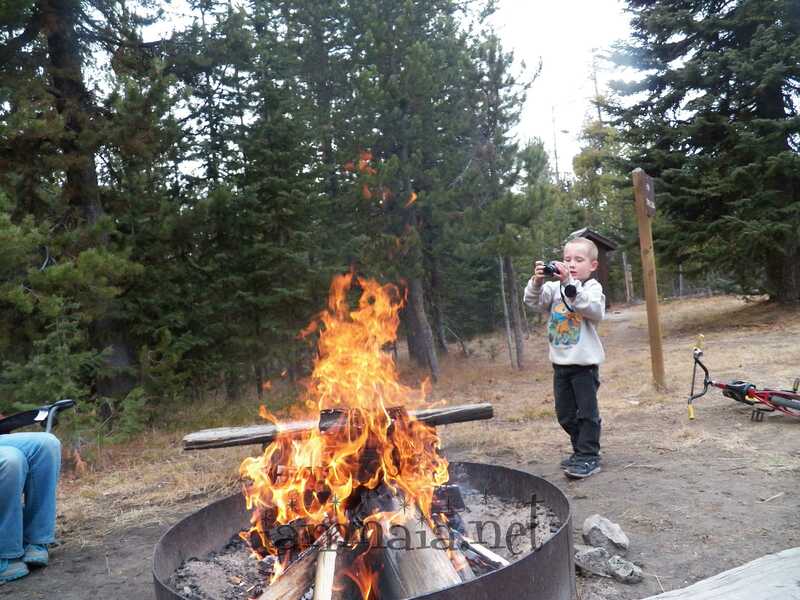 This picture was taken by Brendan and he’s taking a picture of his brother taking a picture of the fire. 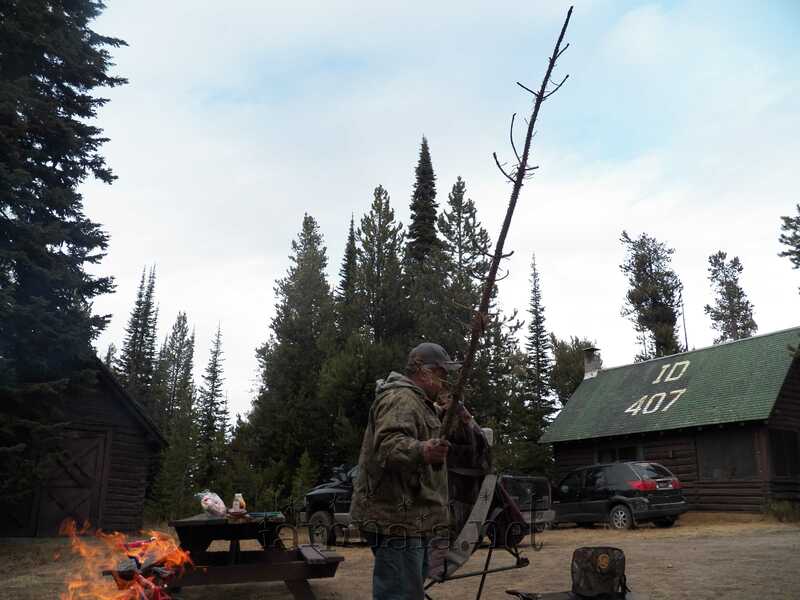 The fire is too hot so ex #1 got a long branch to play with the fire. We all had to scoot back from such a hot fire. Another look at daddy’s big and long stick. That’s it for now. I’ll add more later. We were having a great time, despite the Rendy breaking. We found out last night what actually happened. Apparently, when they fixed the heads (not hubs as I typed wrong the other night), they stripped the screw that holds the rocker arm on. So, back to where the heads were fixed for them to replace number 3 head with screws that aren’t stripped. Bolts not stripped? Something like that. Off to do my daily chores around the house. I’ve got some catching up to do, both online and around my house.